If your obscenely carnivorous diet includes enough ribs, brisket, pulled pork, and BBQ sauce, then most days can feel like National BBQ Day. Unfortunately, the mysterious authority in charge of establishing these so-called "food holidays" only blessed the calendar with one day to celebrate all things BBQ: May 16. 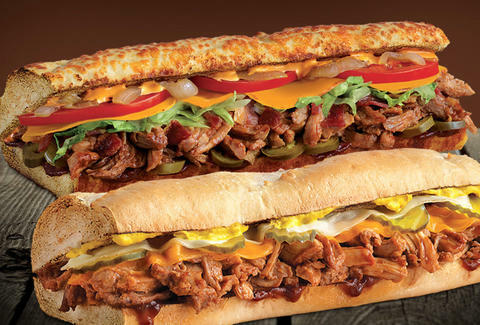 In honor of the occasion this year, Quiznos has launched a new promotion that will get you a free pulled pork sub. On Wednesday, May 16, Quiznos locations across the United States will give you one free pulled pork sandwich when you purchase a second one at full price. You can choose between two new pulled pork options -- the Southern Style BBQ Pulled Pork or the Spicy Chipotle BBQ Pulled Pork -- that just hit the sandwich chain's menu on May 8. Both versions feature a cut of lean pork shoulder that is roasted low and slow for six hours before it's hand-pulled for your sandwich, according to a press release. As the names suggest, the Southern Style sandwich is on the sweet and tangy side, while the Spicy Chipotle sandwich is spicy and smoky. To get your free sub, all you have to do is download Quiznos' Toasty Points loyalty app and create an account (if you don't already have one) and claim the offer via a digital coupon. You have to use the coupon by May 23. Other than that, there's not much other fine print: The offer is good for one free sandwich per person. Pretty simple. Of course, like any buy-one-get-one (BOGO) deal, this one requires you to spend money in order to score the freebie. But then again, you couldn't ask for a better excuse to try both pulled pork sandwich flavors in one sitting. Tony Merevick is Senior News Editor at Thrillist and feels like so-called food holidays are only getting bigger and bigger every year. Send news tips to news@thrillist.com and follow him on Twitter @tonymerevick.